The Tigers are warming up themselves well in South Africa as they declared the 1st innings with 306/7 on Day-1 of their three-day tour match against SA Invitation XI at Willowmoore Park, Benoni on Thursday. Bangladesh won the toss and opted to open the 1st innings with bat and played 74.1 overs before declaring the innings where Mominul Haque (68), skipper Mushfiqur Rahim (63) and Sabbir Rahman (58*) hit half century each. At tea, the Tigers were at crease with 220/6 in 49.4 overs when Sabbir Rahman, who played an unbeaten innings of 89 balls to fire 9 boundaries, was at the crease with four runs. Mehidi Hasan Miraz (18 off 38b; 3x4) was another double-digit scorer in the 3rd session while Taskin Ahmed was on crease till the end with 8 runs. Earlier, Mominul and Mushfiq shared a partnership of 119 in 24 overs in the 3rd wicket stand, starting from 92/2 in 23.4 overs after the departure of Soumya Sarkar who was out for 43 runs. Mominul faced 73 balls and fired nine boundaries before being caught behind by Heinrich Klaasen off left handed pacer Michael Cohen at 211/3 in 47.4 overs. In the next 12 balls after Mominul’s departure, two wickets -- Mahmudullah Riyad, Mushfiq and Liton Kumar Das -- were out leaving their team total at 220/6 in 49.4 overs. Mushfiq fired eight boundaries off 85 balls and was caught by Matthew Breetzke off Michael Cohen while Soumya Sarkar (43 off 69b; 8x4) and Imrul Kayes (34 off 51b; 4x4) were the other notable scorers for Bangladesh. Soumya and Imrul contributed 84 runs in 20.2 overs in the 2nd stand after the retirement of Tamim Iqbal. Tamim (5 off 13b; 1x4) retired hurt at 11 in 4.2 overs when Soumya Sarkar was on 4 off 14 balls. Michael Cohen captured four wickets for economic 23 runs while pacer Migael Pretorius, Tladi Bokako and leg break bowler Shaun von Berg took one wicket each for the side. 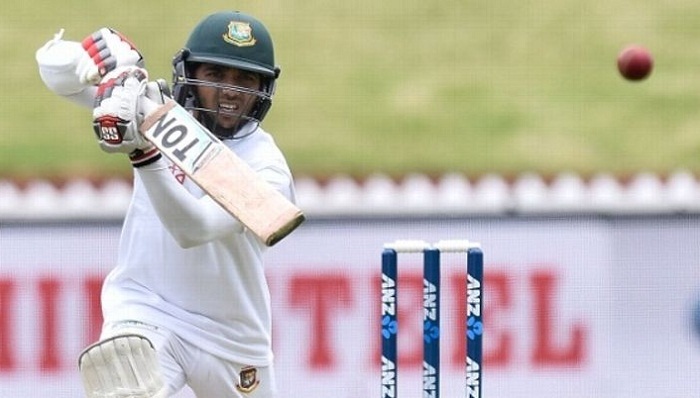 Bangladesh 1st innings: 307-d in 74.1 overs; Mominul Haque 68, Mushfiqur Rahim 63, Sabbir Rahman 58*, Soumya Sarkar 43, Imrul Kayes 34, Mededi Hasan Miraz 18, Michael Cohen 4/23, Migael Pretorius 1/49, Tladi Bokako 1/48, Shaun von Berg 1/96.